An underwater computer with an interface to a microscopic imaging unit is enabling scientists to noninvasively image seafloor environments and organisms in situ at nearly µM resolution. Developed by a team at the Scripps Institution of Oceanography at the University of California, San Diego, the system — Benthic Underwater Microscope (BUM) — will help scientists better understand the dynamic ecological processes taking place underwater on a microscopic scale. Imaging the seafloor environment presents significant challenges, including active instrument positioning, precise focusing and reflectance illumination. Previous efforts to observe microscopic activities on the marine benthos have been hampered by their intrusive nature and limited ability to collect spatial and temporal data. To overcome these challenges, BUM incorporates three principle optical components: a long working distance microscope objective lens; a shape-changing Electrically Tunable Lens (ETL); and focused LEDs. 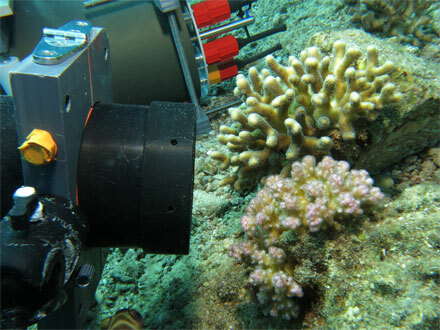 The Benthic Underwater Microscope is positioned to study coral competition. Courtesy of Jaffe Laboratory for Underwater Imaging/Scripps Institution of Oceanography, UC San Diego. A long working distance microscope objective lens provides the magnification and numerical aperture required to resolve fine details, as well as the working distance necessary to image through an optical port while leaving the subject undisturbed. A deformable ETL enables rapid focusing and viewing of structures in 3D, while a custom-designed ring of six LEDs provides the high-intensity light required for short duration, reflectance illumination. The entire system is portable, self-contained and submersible, enabling underwater operation of the instrument in the ocean by a single diver. BUM is able to record dynamic natural processes and spatial patterns with minimal disturbance to benthic organisms or their surrounding physical environment, the researchers said. It can also be used to collect extended time-series recordings to reveal slow or periodic activities and processes. This assists in the study of animal behavior, and enables temporal and spatial analysis of ecologically significant phenomena at scales previously unseen in a natural environment. It records images with an optical resolution of up to 2.2 μm, enabling observation of fine anatomical details of organisms in both the lab and field. The noninvasive nature of the system allows recordings of small, fragile specimens such as the initial stages of micro algae colonizing bleached corals. 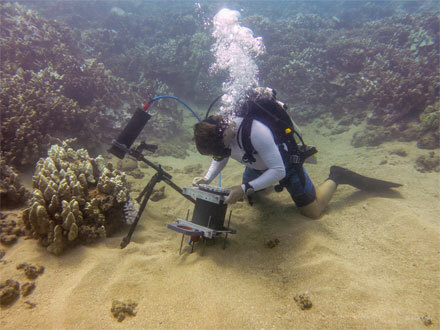 To test the instrument's ability to capture small-scale processes taking place underwater, the researchers used the imaging system to view millimeter-sized coral polyps off the coast of Israel in the Red Sea and off the coast of Maui, Hawaii. During experiments in the Red Sea, the researchers set up the BUM to capture the interactions of two corals of different species placed close to each other. The images revealed micro-scale processes in which corals wage a chemical turf battle to destroy other species in a competition for seafloor space. Scripps Oceanography graduate student Andrew Mullen positions the Benthic Underwater Microscope to study corals. Courtesy of Jaffe Laboratory for Underwater Imaging/Scripps Institution of Oceanography, UC San Diego. When the researchers placed corals of the same species side by side, they did not compete with each other. A variety of enhanced imaging methods may be incorporated into future BUM designs to enable additional information on microscale physical and biological phenomena. 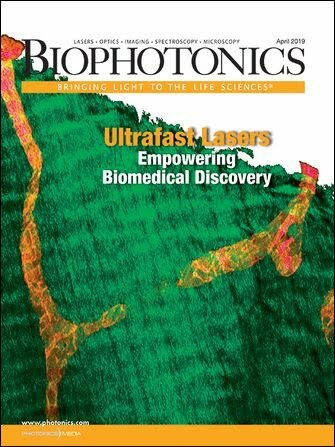 According to the researchers, the methods may include variable chlorophyll fluorescence imaging to study photosynthetic efficiency; micro-particle image velocimetry to study small-scale fluid dynamics; chemical measurements using optical indicators; or 3D modeling of imaged subjects using the depth information that is available from the ETL focus stacks. By enabling in situ observations at previously unattainable scales, the BUM may provide insights into micro-scale processes in benthic ecosystems that shape observed patterns at much larger scales. The in situ viewpoint provided by the BUM may enable novel investigations on basic marine research and provide a means to connect theoretical lab work to the natural environment. "This underwater microscope is the first instrument to image the seafloor at such small scales," said Andrew Mullen, graduate student at Scripps Institution of Oceanography at UC San Diego. "The system is capable of seeing features as small as single cells underwater." The research was published in Nature Communications (doi:10.1038/ncomms12093). Scripps Oceanography graduate student Andrew Mullen discusses the research being conducted using the Benthic Underwater Microscope, an instrument recently developed by the Jaffe Laboratory for Underwater Imaging at the Scripps Institution of Oceanography at UC San Diego. Courtesy of Scripps Institution of Oceanography at UC San Diego. The ratio of reflected flux to incident flux. Unless otherwise specified, the total reflectance is meant; it is sometimes convenient to divide this into the sum of the specular and the diffuse reflectance.